Unlike brick-and-mortar stores, online t-shirt stores don’t give customers the benefit of being able to touch and feel the product. One of the only ways to successfully sell your t-shirts to your customers online is through appealing product images. Fortunately, t-shirts are one of the best products to market through photographs because people already have a good sense of what a t-shirt is and can thus easily visualize how it would look in real life. Nonetheless, the better your image, the more trust your consumer has in your product and the more likely you are to make the sale. T-shirts are an oversaturated market as it is, so you want your product images to be as good as they can be so they stand out. Before you go and spend a fortune on professional product photos for your t-shirts, we’re going to show you a time and money saving alternative. In this article we’ve highlighted some of the best places to get t-shirt mockup templates. These templates are generic images of t-shirts that you can digitally place your designs onto, meaning get professional product photos without the costly investment and you get to add as many of your designs onto whichever template you choose. Whether you’re just looking to start your own online t-shirt store or even if you’re looking to start your own clothing line, using t-shirt mockup templates for your product images will give them a more professional, high-quality and uniform appearance without you having to spend lots of time and money through DIY or hiring a professional team. Let’s jump into the 7 best places to find t-shirt mockup templates for your t-shirt business. 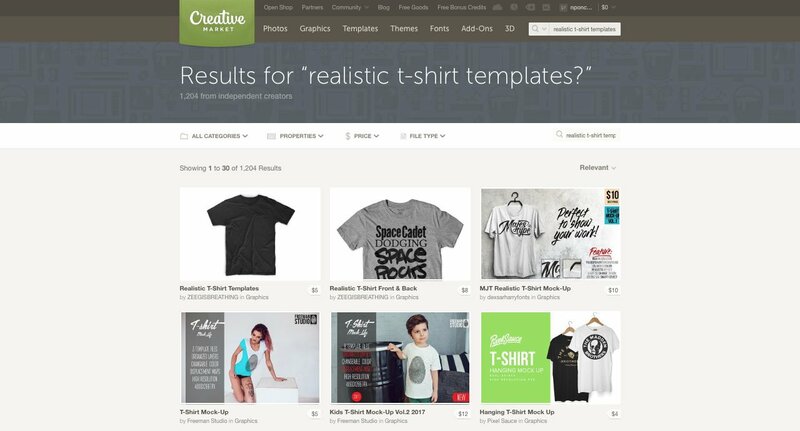 Creative Market is one of the best sites for digital assets as they have an incredible range products and their t-shirt templates are no exception. 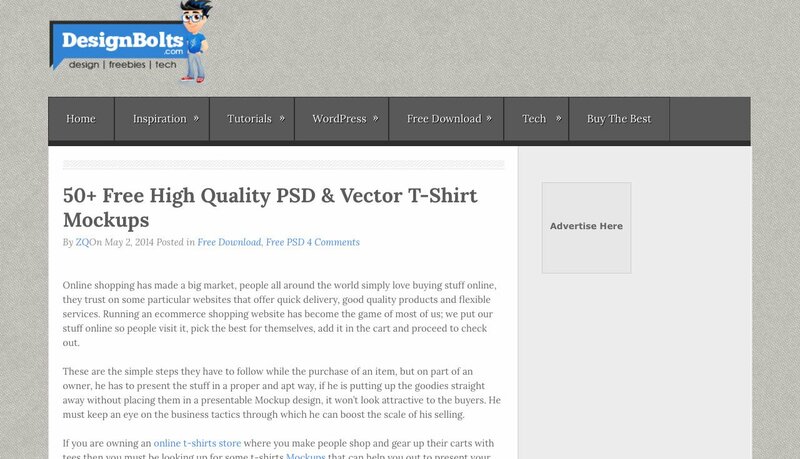 There are over a thousand t-shirt mockups to choose from, starting from as low $3. There really is no limit to what you’ll find in the selection – classical styles, modern, virtual store images and much more. If you prefer to show your product worn by a model or a group of models, it’s all there – male, female, kids, family, the works. They also offer bundles of up to 100 different images in one package. No matter what your style, preference or budget is you’re going to find a high-quality and original t-shirt mockup templates here. Each design is different, so some need to be edited through Adobe Photoshop, others may allow you to copy and paste your image right onto the template, some will be vector files. Creative Market has the best selection of templates at the best prices, so be sure to check out what they offer. 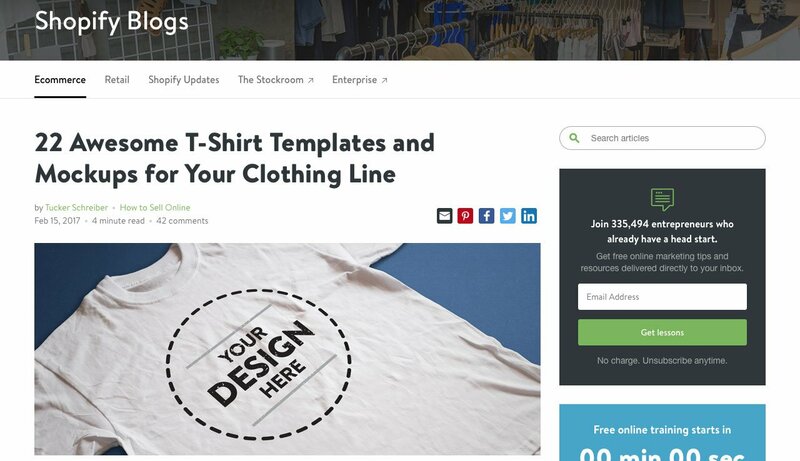 Shopify has a comprehensive blogpost detailing 22 different online resources you can utilize for t-shirt mockup templates and no doubt one of these resources will have the perfect mockup template you’re looking for. Whether you want the t-shirt shown in the image laying on a solid background, worn by a model, hung on a hanger, or any variation of those options, these 22 resources have you covered. 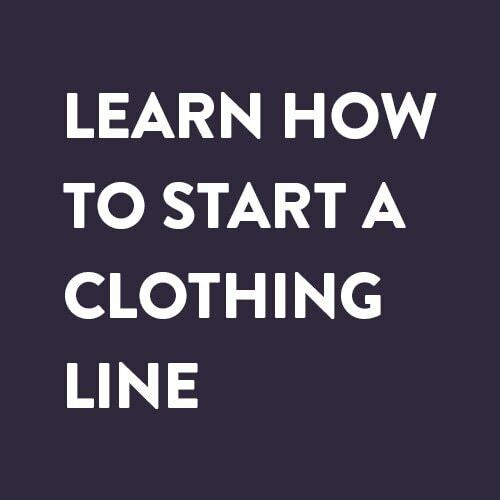 The resources included in this roundup also include varying t-shirt styles such as polo neck t-shirts, collared t-shirts, muscle t-shirts, etc. so even if you have a particular t-shirt style these resources may be a good option for you. 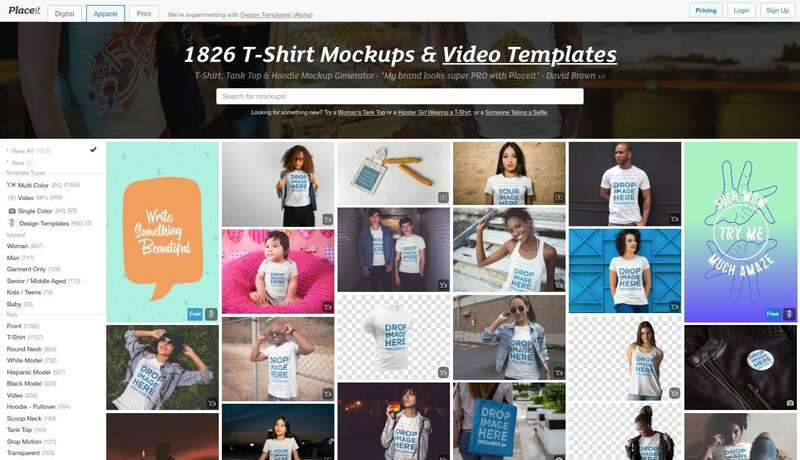 PlaceIt is a stock photo site that specializes in mockups from apparel to smartphone apps but they have an especially large library of t-shirt mockups and video templates. It’s not a royalty-free site which means you will have to pay for licenses to use the templates you download, but this does mean the images and videos are professional quality. Prices start at $29/month which allows you up to 9 high-resolution template downloads. The site offers an incredible selection of mockup templates with over 1,800 available to choose from. To make it easier to navigate through their wide selection of photos they provide useful search filters such as men, women, garment only, age group, ethnicity of the models, and more, to narrow down what you’re looking for. As an added bonus, PlaceIt also offers a video templates that you can insert your designs into. The final result is very realistic – it actually looks like the model is wearing your design. All you have to do is upload your t-shirt design and the PlaceIt software will seamlessly integrate it into the video. Pricing for the videos starts at $99/video or $199/month for their video plan which includes unlimited video and image downloads. Design Bolts offers a wide range of styles and backgrounds available as either Adobe Photoshop or Vector free download files. Most are fairly plain images of just the shirt on a background, though some have models wearing the shirts so the final result will be very realistic. This article lists 50 different templates, from a variety of sources and the overall quality of the images are good. If you’re looking for good quality, generic and free t-shirt mockups you can’t go wrong with this site. It’s easy and straightforward to use and offers a wide range of options. 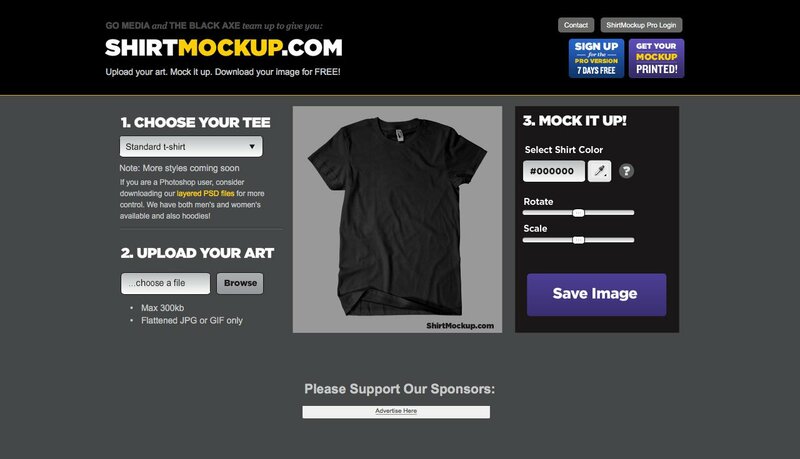 ShirtMockup is an easy to use design software you simply just have to upload your design to and it will mockup your t-shirt. There are a limited number of mockup options to choose from when using the free version of ShirtMockup and there’s also a watermark overlaid on the image, however when upgrading to their pro plan for $9.99/month, you get access to more features and removal of the watermark. If you’re looking for a simple t-shirt mockup and need very few options to get the right look, ShirtMockup is a good choice for you. It’s easy to use, fast, and no-nonsense, and has a free option. Shopify offers a mockup generator tool that’s simple and free to use. 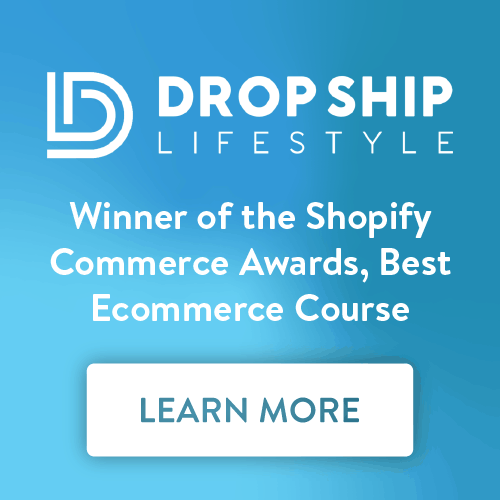 The biggest advantage is that this generator syncs with your Shopify store so you can simply use the generator to mockup your t-shirt designs and it conveniently uploads it straight to your Shopify dashboard. It’s designed to make it as easy as possible for you to create, print and market your t-shirts in as few steps as possible. However, there are very few options for change with the Shopify generator so you aren’t able to alter the colour of the t-shirt, whether it’s being worn on a model, on a hanger, etc. so if you’re looking for a template mockup you can adapt to fit those needs this many not be the mockup generator for you. 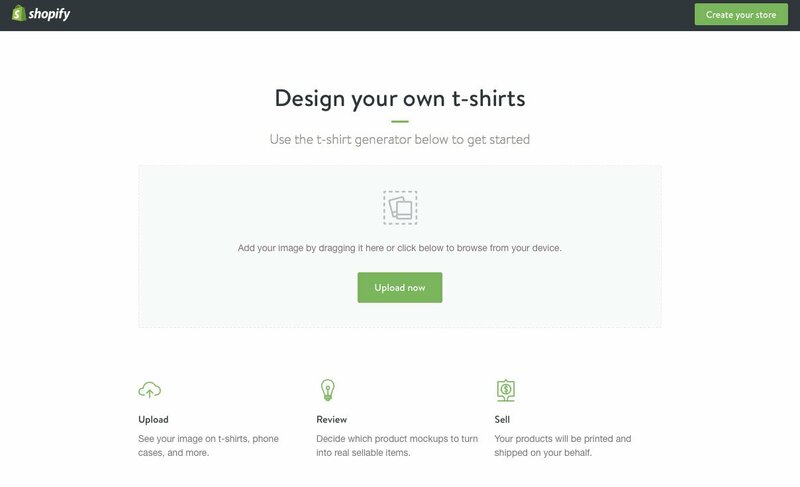 Printful’s mockup generator is especially useful because they offer a large selection of t-shirts to upload your designs onto, so you can get a good feel for how your designs will look on different kinds of t-shirts. They offer unisex, men’s, women’s, youth, kid’s and babies t-shirt types and within each of those categories they also offer short-sleeved t-shirts, long-sleeved, tank tops, sweatshirts and more, all in their appropriate colour ways. 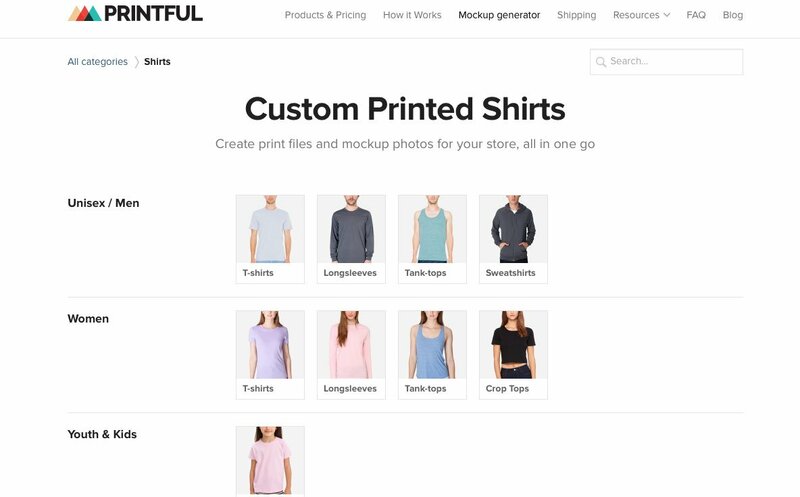 If you’re dropshipping your t-shirts through Printful you should definitely use their mockup generator as it will give you the best idea of how your designs will look on their products. 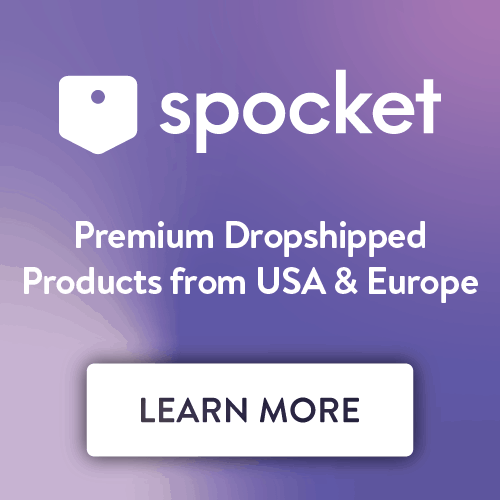 If you weren’t planning on dropshipping your t-shirts through Printful, play around with their mockup generator to get a look at the products they offer and that may sway you to use their convenient dropshipping service. Their mockup generator is high quality, comprehensive, and offers a variety of choice, plus it’s free to use. It’s worth experimenting with a few different mockup types, so pick a few different template options, add your designs to them and see how they turn out. Try adding your designs to t-shirt mockups on hangers, models, different backgrounds, t-shirt colours, etc to get a feel for how it makes the overall design appear. Ultimately the purpose of using these t-shirt mockup templates is to create beautiful product photos that will engage your customer’s interest, so test out a few options and see which work the best.